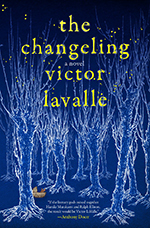 Master of literary genre fiction Victor LaValle returns to Greenlight to present his newest novel The Changeling, a modern horror story that explores the eerie realms of family and nostalgia and the creeping reach of social media. Set largely in LaValle’s native Queens, New York, the novel imaginatively explores the secrets that make strangers out of the people we love the most, the gruesome legacies that threaten to devour us, and the homely, messy magic that saves us, if we’re lucky. Marlon James calls the book “A dark fairy tale of New York, full of magic and loss, myth and mystery, love and madness. The Changeling is a mesmerizing, monumental work.” LaValle discusses his work at Greenlight, followed by a book signing.